Will the stock market crash in 2019? If you ask Wall Street and Capitol Hill, the answer is a resounding “No.” Investor optimism is high, the U.S. economy seems strong, and stocks have been rebounding. But there are a number of key factors suggesting that the U.S. is teetering toward a recession. If the U.S. economy falls into a recession, the chance of a stock market crash, especially at this point of the economic cycle, becomes that much more real. Will the Contrarian Predictions Come True in 2019? Even if a 2019 recession and stock market crash were a 100% given, you’d never hear analysts admitting it. During the height of the 1990s dotcom stock bubble, analysts—and even New York City mayor Rudi Giuliani—were celebrating the Dow Jones being at 10,000, with visions of 20,000 not far away. That didn’t end well. And in 2007, analysts gushed about how strong the stock market was. That didn’t end well either. Analysts and economists remain optimistic now; how could they not? The current economic expansion, at more than 10 years, is the longest on record. That said, they didn’t pop the champagne corks with the same vigor in 2018 as they did in 1999. Even they know that the markets go through cycles. And right now, the markets are volatile. 2018 was a roller coaster ride that ended with a minor crash. The S&P 500 ended the year 6.5% in the red and the Nasdaq ended the year down 4.3%. Moreover, it was the worst December to hit Wall Street since the Great Depression, with tech stocks ending a nine-year winning streak. This might explain why Wall Street is now taking a more heartfelt look at where the markets are heading. Of course, correlation is not causation. Just because Wall Street is sounding the alarm does not mean the U.S. will enter a recession in 2019 and that the stock market will crash. The very fact that CEOs, CFOs, and Wall Street analysts believe that the U.S. could enter a recession in 2019 shows that they believe the stock market has entered the late stage of a cycle. Business cycles help determine the direction of stocks. If the U.S. is now in the late stage of this business cycle, it means that a stock market crash or major correction is on its way. As mentioned earlier, there are several key factors that point to an upcoming recession and stock market crash. One popular recessionary signal is nearing crisis level. In December 2018, the yield curve inverted for the first time in the current business cycle. That means the two-year bond was trading higher than the 10-year bond. This suggests that investors are more worried about the short term than the long term. This simple narrative has been eerily accurate at predicting every recession over the last 60 years. 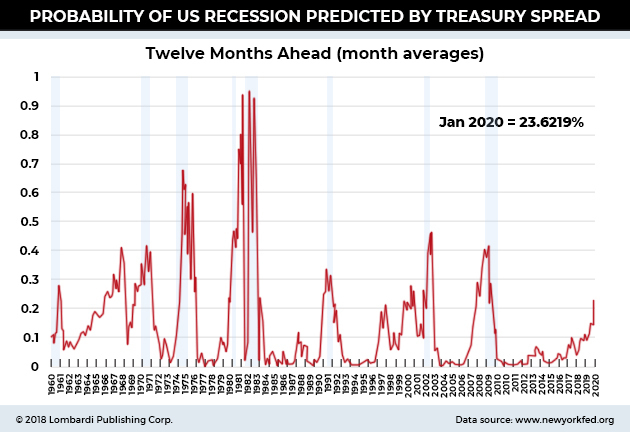 The probability of a U.S. recession hasn’t been that high since 2008. A probability reading of 23.6% might not sound like much; after all, a reading of 50% or higher seems worse. But the fact is, the U.S. has experienced three recessions since the early 1980s, the last time the New York Fed’s recession probability index topped 50%. To help kickstart the economy after the Great Recession, the Federal Reserve sent interest rates down to almost zero. Cheap money was supposed to make it easy to borrow and get the economy roaring again. The U.S. economy is now humming along, but personal debt loads are high. In 2018, the Federal Reserve increased its key lending rate four times, making it more expensive to borrow for everyone. 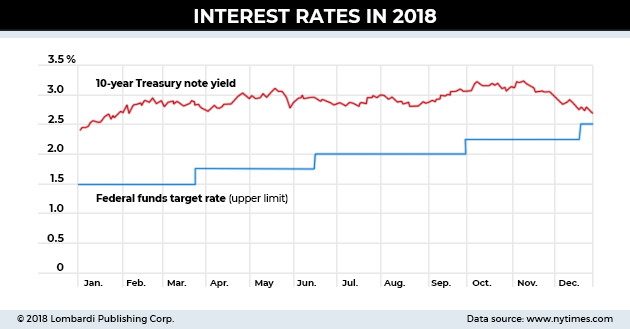 The yield on the 10-year Treasury note, which is what mortgage rates and corporate loans are based on, climbed to its highest level since 2011. When interest rates rise too fast, it can result in corporate America pulling back. Higher interest rates also inhibit consumer spending—not a big surprise when you consider that 80% of Americans are living paycheck to paycheck. If interest rates rise too quickly, the U.S. economy could get hobbled and head into a recession and a stock market crash. It gets worse: the annual federal deficit keeps growing, not shrinking. It’s fine to spend money if you’re going to eventually pay it down, but the U.S. isn’t in any position to do that. President Donald Trump has championed his tax cuts, as have many taxpayers, but spending hasn’t slowed down at all. The Trump administration believes that a booming U.S. economy will create jobs and the revenue needed to service the country’s debt. But no economists think that the U.S. economy will expand at the rate touted by the White House. As the world’s largest economy, there are more than enough governments around the world willing to take on U.S. debt. But that might not always be the case. If the U.S. fails to address its budget deficits, it could lose the confidence of foreign debt holders. As the country’s debt-to-gross domestic product (GDP) ratio increases, U.S. debt holders may want larger interest payments to compensate for their increased risk. If the risk remains high, foreign investors might want to simply take their money elsewhere. This would lead to higher interest rates, which would chill the U.S. economy. Spending money to help the U.S. get out of the Great Recession when interest rates were low made sense. But continuing to spend unabated while the economy is strong—and interest rates are on the rise—doesn’t make as much sense. Even outside the U.S., there’s a lot of debt. Global debt has nearly doubled over the last 15 years. And since 2015, global private sector debt has soared by around 15% of global GDP; a level higher than during the leadup to the last global financial crisis. Despite a stronger economy, the debt-to-GDP ratio has topped 318%. That’s only slightly below the record debt-to-GDP ratio of 320%, which occurred in the third quarter of 2016. It’s pretty tough to pay back debt that’s more than three times GDP. In fact, some would say a person is reckless if they spent 318% of what they made in a year. Global debt is like a runaway train. Emerging markets, especially China, have been the main driver of growing debt over the last decade. It’s not just emerging economies though; developed countries like France, Canada, and Chile also have big debt problems. And if these countries don’t address their debt problems, it will have serious implication for the global economy. The IMF blamed its weaker projections on lower growth forecasts in both advanced and emerging economies, and on the negative effects of the trade war between the U.S. and China. The organization also cited fears of other negative shocks that could trigger economic deterioration and risks to growth. They include a “no-deal” withdrawal of the U.K. from the European Union and a greater-than-expected economic slowdown in China. No country is an economic island. China’s slowdown has already hurt economic prospects in Brazil, Russia, and South Africa. A bigger economic downturn in China or an unexpected recession in Europe would hurt the U.S. economy and stocks. The record bull market is more than 10 years old, but the U.S. economic recovery has been unstable. Despite trillions of dollars in economic stimulus, the U.S. has been posting less-than-stellar growth rates—at least relative to the amount of money pumped into the economy. Despite the underwhelming economic growth, stocks remain near record-high levels, which suggests that stocks are overvalued. And they are, according to one of the most popular metrics for stock valuations. Regardless of when the next stock market crash or correction is, history shows that it never ends well for stocks when they’re this overvalued. To get a grasp on when the next recession and stock market crash is going to happen, analysts suggest paying close attention to hard economic indicators, including income, employment, business sales, and GDP. Unfortunately, by the time those numbers are flashing red, it will be too late. The U.S. economy will already be in a recession and the stock market will already be reacting. The stock market, just like the broader U.S. economy, goes in cycles. Over the last 60 years, the S&P 500 has experienced eight bear markets (slumps greater than 20% from recent highs)—once every 7.5 years. So we know with certainty that there will be another stock market crash. Thanks to sky-high valuations, it could be a lot worse than the last one. History also shows that the markets always rebound higher, as is evidenced by the fact that the S&P 500 recently hit a new high. It’s impossible to time the next recession and stock market crash, but the evidence suggests that the next crash is in sight.